When I first started training for endurance sports, I made the mistake of eating flavored instant oatmeal for breakfast. Just add boiling water and a tasty bowl of sugary oats was ready within minutes. I’ve since learned that steel cut oats (also known as Irish oats) is much healthier. 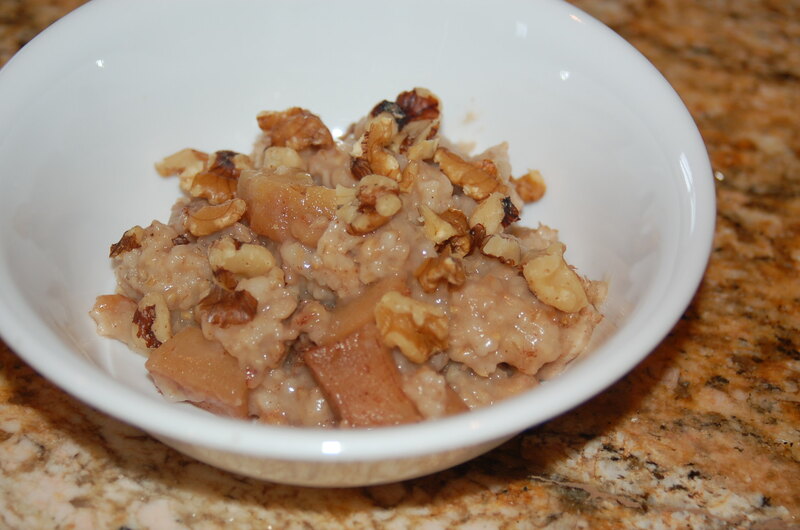 Steel cut oats contain no sugar, unlike flavored instant oatmeal which is loaded with sugar. Some rolled oats also contain sugar. Steel cut oats undergo less processing than rolled oats and instant oats. The problem with steel cut oats is that it takes about 20-30 minutes to prepare. I tried soaking steal cut oats in water overnight. Although that helped to reduce the cooking time, it still wasn’t fast enough for me. So I tried preparing the oatmeal the night before, storing it in the refrigerator, then warming it up in the microwave the next morning. Unfortunately, I did not enjoy how the oatmeal congealed into a mushy glob. Finally, I tried cooking the oatmeal in a slow cooker overnight. That was a huge success! I mixed all of the ingredients into a slow cooker before I go to bed and then voila, I wake up to warm, cooked and delicious oatmeal. Since it’s important to refuel within 20 minutes after a workout, I will pack another serving of oatmeal to bring to work. I’ll either eat it cold or warm it up in the microwave. Yes, this means that on the mornings I workout, I have 2 breakfasts. In addition, I like to consume a protein along with a second serving oatmeal, such as a hard boiled egg or Greek yogurt with fruit and/or granola. Note: Ideally, if you can do without the dark brown sugar, that is the healthiest option, but I personally prefer to have a small amount of it in my oatmeal. Since this recipe is a serving size for 4, one tablespoon isn’t so bad. 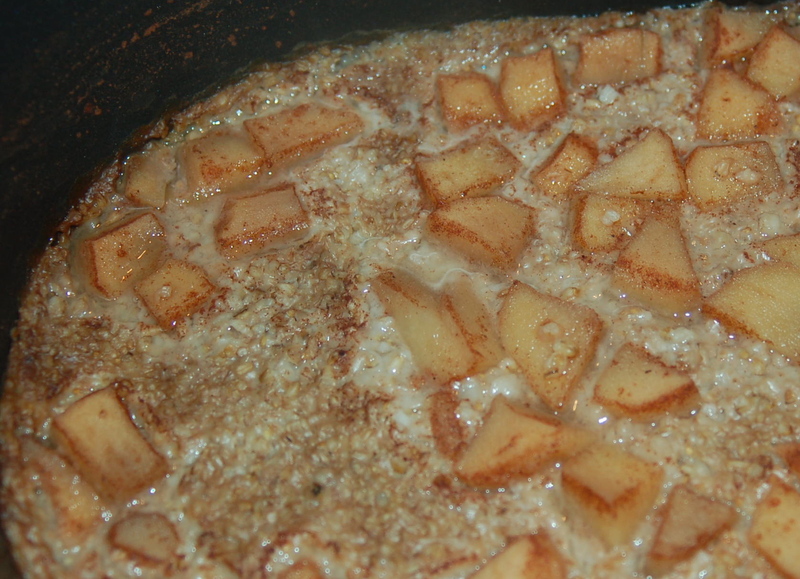 The apples also help to naturally sweeten the oatmeal. If you prefer your oatmeal on the sweeter side, you may want to add up to another tablespoon full, however I encourage you to try to savor the natural sweetness from the apple and avoid adding more sugar. Mix all of the ingredients and pour into crockpot. I used a 6.5 quart slow cooker with a non-stick insert but a smaller 4 quart slow cooker is all you need. If the insert is not a non-stick surface, you will want to spray it with oil. Cover and cook on a low temperature for 7 hours. If you prefer, serve with chopped walnuts or almonds. I recommend you test this recipe out during the daytime, to determine if you can achieve the desired results with your slow cooker. 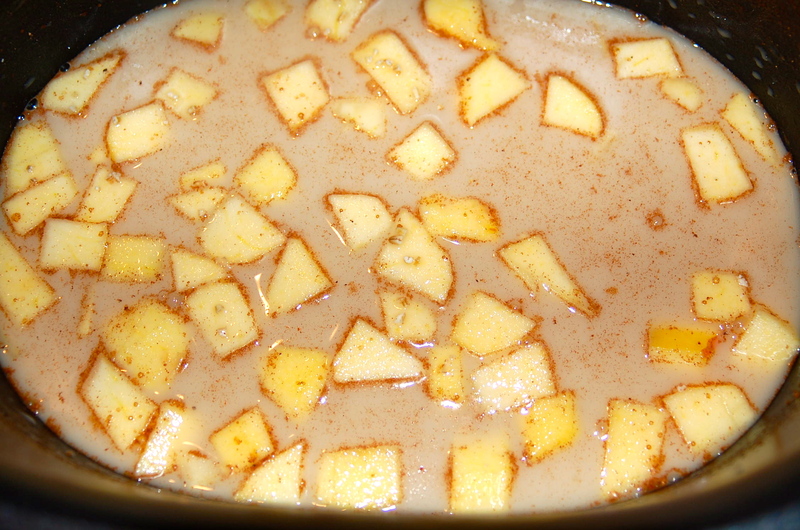 If the oatmeal is too dry, you may need to add more liquid at the beginning. You may also want to experiment plugging your slow cooker into a timer and cooking the oatmeal for fewer hours. My slow cooker does not work with a timer, so I need to leave it on for at least 7 hours. Who doesn’t like granola? 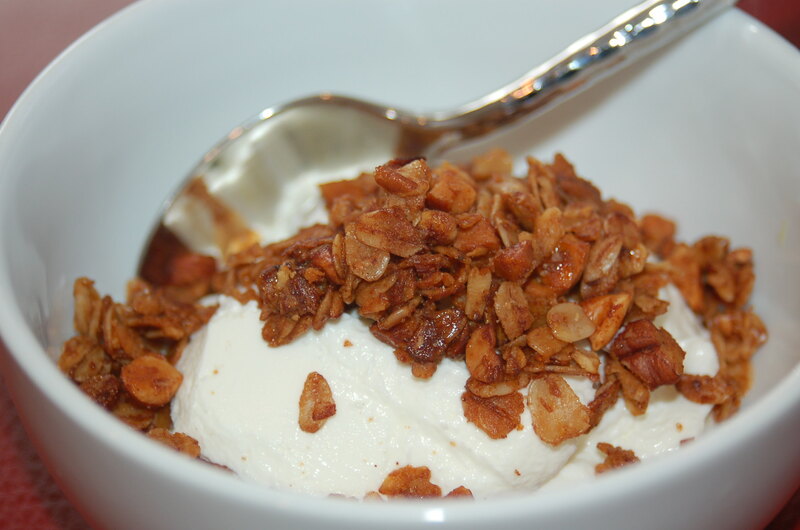 My favorite way to enjoy granola is over Greek yogurt for breakfast. Sometimes I’ll add milk to a bowl of granola for a great alternative to cereal; sprinkle it over ice cream as a yummy crunchy topping; or add 1/3 cup of dried fruit, such as cranberries, cherries, raisins, dates or apricots, and eat it by the handful as a snack. 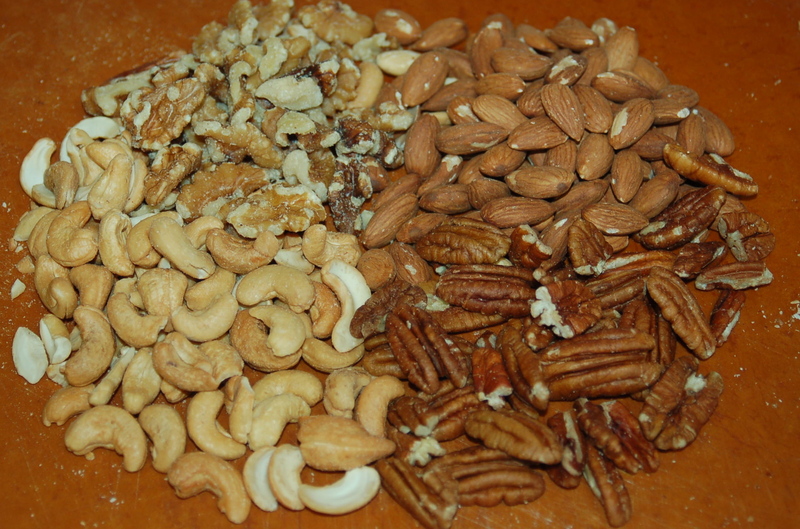 The type of nuts or seeds can be swapped out. I sometimes use more walnuts and omit the pecans or use pepitas (pumpkin seeds) instead of sunflower seeds. Choose your favorite nuts. Just make sure the nuts are unsalted. The granola can be stored up to 1 week in an airtight container. 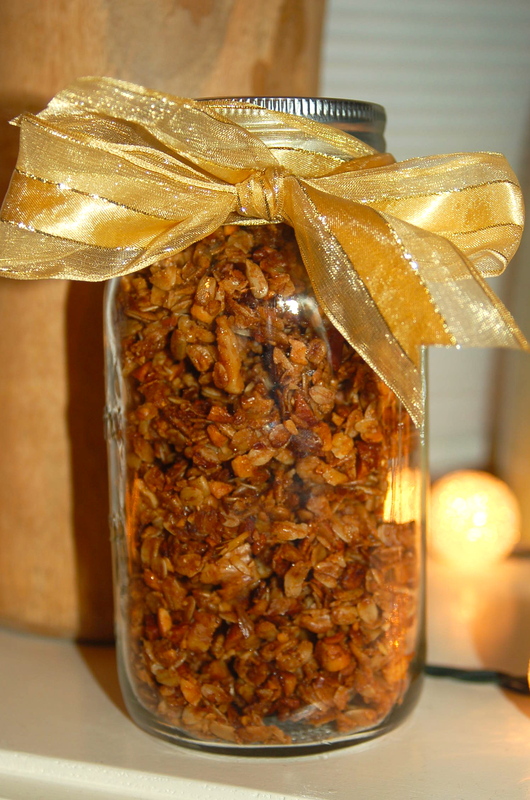 Placed into a mason jar wrapped with a bow, fresh homemade granola makes a nice little gift. Who doesn’t like granola? Combine oats, sunflower seeds, chopped nuts, cinnamon and salt in large bowl. In separate small bowl, whisk together oil, honey, maple syrup and vanilla extract. Pour over oat mixture and combine thoroughly. Spread out evenly over parchment lined baking sheet. Bake for 30-35 minutes until golden brown, stirring granola every 12-14 minutes to ensure even browning. 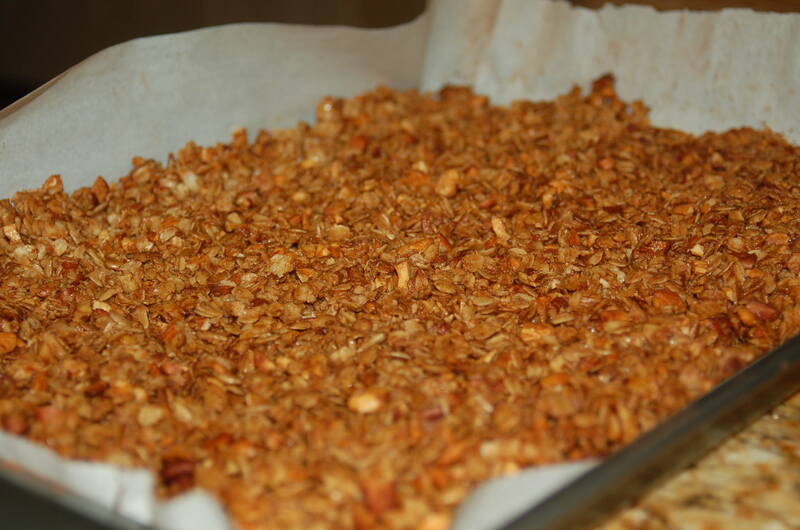 Allow granola to cool on pan completely unless you forgot to line the pan with parchment paper. Clean up might be easier if the granola is transferred from an unlined baking sheet to a glass casserole dish to cool. Otherwise, the granola will cool to crisp little chunks and slide right off the parchment paper. I prefer to leave the granola in some smaller chunks to store. Cool and store in airtight container up to 1 week, if it lasts that long. I like a variety of nuts, including walnuts, almonds, pecans and cashews, in my granola. Choose the combination of you enjoy most. The granola can be stored up to a week in an airtight container. They also make nice gifts. Stop the presses. This is the most awesome two ingredient pancake to hit the griddle, and my stomach. Technically it’s three ingredients, since one additional ingredient is needed to keep the pancakes from sticking to the griddle. Embellish the pancakes with cinnamon, nuts, yogurt, and berries, and now you have a few more ingredients but the pancake itself can be made with just one banana and one egg. That’s it. Our wonderful run coach, Lisa Engles shared this recipe with me while at dinner at our team’s favorite healthy post-track hangout. A ripe banana provides enough sweetness that additional syrup or sugar is not needed. 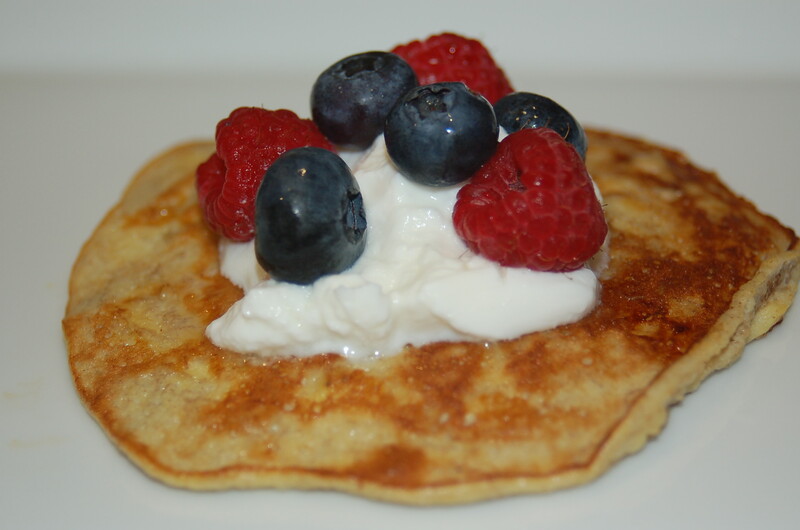 These pancakes are even sweet enough to enjoy as a healthy dessert, which is how I first savored them since I tested the recipe after dinner. Using an electric or hand mixer, combine bananas and eggs until smooth. This can be done by hand but it’s obviously much faster and easier with a mixer. It’s not necessary to mix until completely smooth however the batter should be mostly smooth with very few lumps. If necessary, mash out lumps with a fork or the back of a spoon. On medium high heat, add the coconut oil to the griddle or frying pan. Spoon the batter into four small pancakes on the griddle. 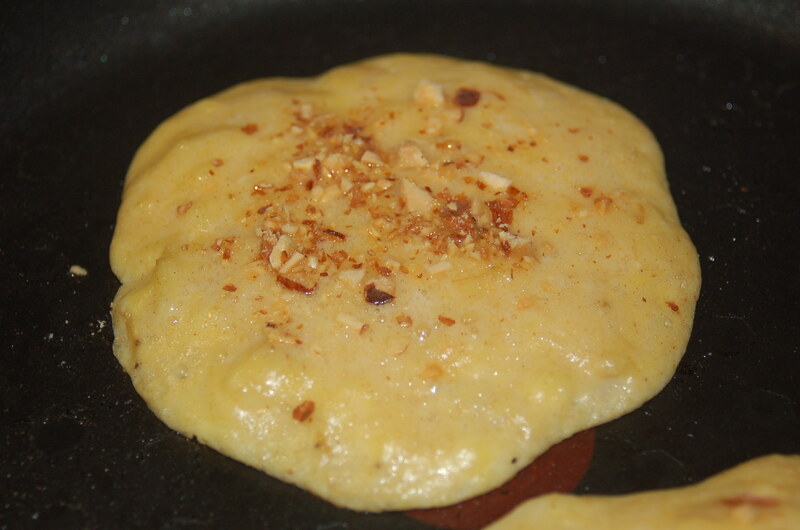 Sprinkle finely chopped toasted almonds on top of each pancake. Cook until the top side of the pancake starts to dry out and the side down is golden brown. Flip over and cook until other side is golden brown. Top with Greek yogurt and fresh berries. Sprinkle toasted and finely chopped almonds to add a nice crunch to the pancake. 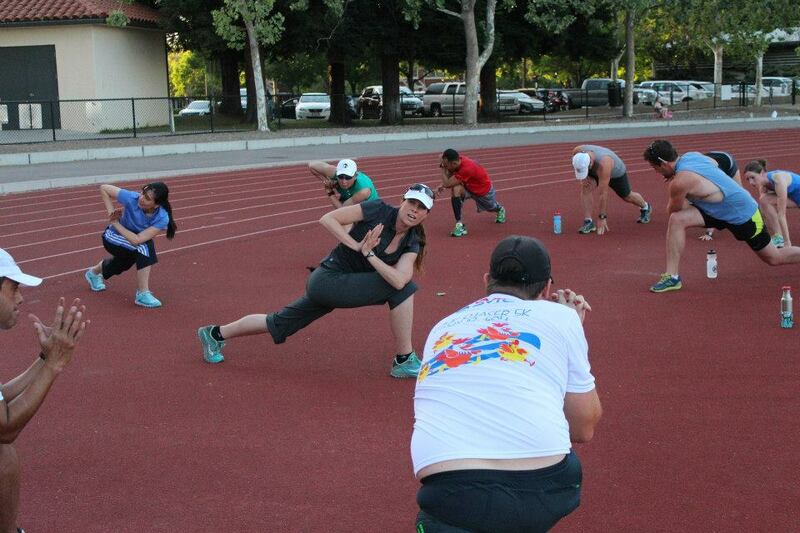 Early morning workouts are a part of my Ironman training schedule. I typically swim in the mornings however the past 2 weeks have been extremely challenging. We have been experiencing unseasonably cold temperatures here in Northern California. I woke up to a balmy 36F. After a swim, I am cold and starved. I typically enjoy steel cut oatmeal with almonds and blueberries but today I was craving something more comforting. Baked eggs with spinach and ham was a satisfying post swim breakfast that warmed my belly up quite nicely. The latest science seems to suggest that eggs are not as bad for you as once thought. I’m happy to be reunited with eggs again. I’m fond of everything made with eggs. Pre-heat oven to 375F. Coat a medium ramekin (the size you’d use for creme brulee) with olive oil. Sprinkle even coating of cheese to the bottom of the ramekin. Crack both eggs into ramekin, being careful not to break the yolk. Sprinkle ham, spinach and parsley around the yolk. Season with salt and pepper. Bake at 375F for 12-15 minutes depending on how well you like your yolks done.